Like many other colonial religious works, the statue of Christ of Tuzas, housed inside of San Francisco in Antigua, is still held as an object of veneration, rather than a work of art. 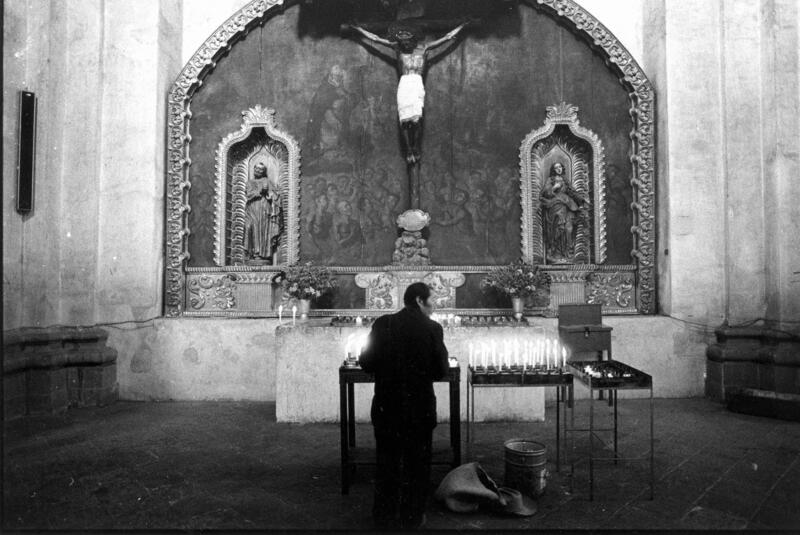 Its ongoing devotional life is captured in this photograph by Mitchell Denburg, whose work from the 1970s and 1980s provides a rich documentation of Guatemalan life. The high degree of naturalism seen in Jesus's sculpted body was a prized quality in colonial crucifixes. In the (now faded) painting set behind the crucifix, angels and saints surround Jesus’s body, as if welcoming him into heaven. Near the base of the cross, souls in purgatory ask for intercession. 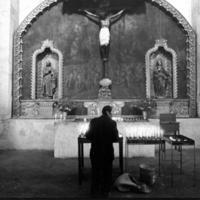 The Franciscan order, which commissioned the church, was one of the most powerful in Central America. They may have commissioned this sculpture from one of the many workshops active in Antigua. Guatemalan sculpture was so prized that it was often exported into Mexico City, in a reversal of the usual relationship between center and periphery. This statue, which dates from early 17th century, was made using a technique called pasto de caña where the armature of the figure is made of the tough stalks of maize, which is then coated with either a kind of paper mâché or plaster-like substance (or both) and painted. Such lightweight materials originally allowed such sculptures to be carried in processions. In certain regions of central America, sculptors still create sacred figures in pasta de caña. Today, the statue is immobile, set against a painted backdrop which vividly illustrates its otherworldly functions. The painting, probably done in the 18th century, transforms a single sculpture into an “environment” as one would find in a retable (retablo). It is still an important object of veneration within San Francisco. This mixing of media—painting and sculpture—was typical in colonial churches, and done to heighten the intellectual and emotional impact of the religious figure. Guatemala ante la lente: Imágenes de la Fototeca de CIRMA/Picturing Guatemala: Images from the CIRMA Photography Archive, 1870-1997. 1998. Antigua, Guatemala: Centro de Investigaciones Regionales de Mesoamérica.